Our rental equipment is the same gear that we dive in! 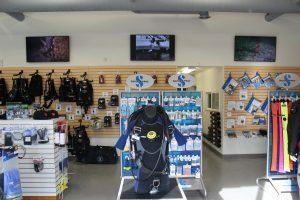 Unlike the approach that some dive shops take, where the rental gear is cheap and “buy your own” is the answer you get when you ask why your drysuit flooded, our rentals are top-of-the-line gear to assure the best experience for you! All of our rental gear is capable of supporting the demanding type of cold-water diving we do here in the land of the midnight sun, whether it’s under the ice in Matanuska, or on an expedition in Resurrection Bay. For added value, we offer all gear including 2 tanks, regulator, BCD, compass, computer, weight, dry suit, undergarment, and hood for $125 per day (up to three tanks!) or $150 for the weekend. Our weekly rate for all gear is the sum of 5 days rental. You get two days free when renting for a week. Call us at (907) 770-1778 to rent now! Our rental line is outfitted with Halcyon BP&W’s and Scubapro BCD’s, and we’re constantly updating it to outfit you the highest quality gear on the market. Our rental regulators are Atomic Z2’s. Atomic makes some of the best breathing piston regulators on the market. Our rental regulators are maintained meticulously for reliability and comfort of breathing. We rent DUI dry suits! The TLS350 from Diving Unlimited International is the premier dry suit for Alaskan conditions. We have more than a dozen suits to make sure we can provide you with a proper fit. Thinking about buying a DUI? Rent one of ours to “test drive” it in the pool before you make the commitment to purchase your own.